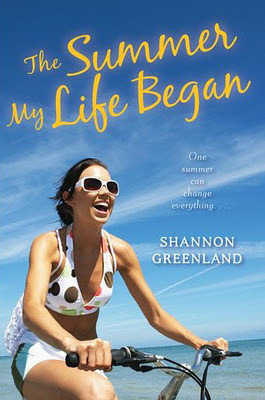 The Summer My Life Began is Shannon Greenland’s newest novel, set to release on May 10th. With summer vacation just around the corner, this novel would make an excellent beach read, or if vacation is beyond your reach, a great way to pretend you’re on vacation. Elizabeth Margaret has always done what’s expected of her. Straight A’s. Admittance into Harvard. A planned career as a lawyer. But when she graduates high school and discovers an aunt she never knew about, her life takes an unexpected turn. Soon she’s left her younger sister and her stuffy, controlling family behind for a month on an island with her free-spirit aunt. Free to do what she likes for the first time in her life, Em indulges her love of cooking as she grows to love her aunt and island life. Then there’s Cade, whose easy-going surfer attitude compels her. She feels more at home than she ever did with her family, and starts re-thinking her options for the future. But her newfound happiness is rocked by her discovery of family secrets she never suspected, and she has to decide who she wants to be: Elizabeth Margaret with her safe, planned life; or Em, risking it all to follow a dream. Em is a great character, full of confliction over what is expected of her, and what she wants. Her love for her family motivates her to do things she doesn’t like, but she’s aching to push the boundaries of her life and find out more about herself. Her aunt’s breezy take on life shines through on the page, and Cade’s laid-back mode of living brings island life to shining, shimmering life in The Summer My Life Began.